Positioned in the Trump Administration on the post of "civil rights" ... tearing down basic laws of humanity and civility in a New Era of distortion of facts, selling snake oil New Style and pure rightwing propaganda for political goals. The U.S. Senate approved bigot Kenneth Marcus as Trump's Civil Rights Czar for Education in the reign of Betsy DeVos. "No Democrats voted for Kenneth Marcus, who backs a definition of anti-Semitism that includes some forms of Israel criticism." The Forward reports that Trump education secretary, Betsy DeVos will nominate "civil rights" lawyer, Kenneth Marcus, as assistant secretary of education for civil rights. Oh the many delicious ironies! Just as his EPA director seeks to destroy the environment and his secretary of the interior seeks to dismantle the national park system, so DeVos is appointing someone antithetical to civil rights to the role of protecting the rights of America's students. Marcus does defend the civil rights of one group, Jews. But not all Jews, only some Jews. Specifically, pro-Israel Jews. Thus in his new role he will be the nation's anti-Semitism czar. As I wrote last year in Alternet, Marcus pioneered a particular form of pro-Israel lawfare which argues that pro-Israel Jews have special rights. That is, that support for Israel is a civil right and that anyone on campus who questions or attacks Israel is essentially engaged in what he calls, "anti-Israelism." Why Do Jewish Voices Promote Hatred of Muslims? Attorney Alan Dershowitz, for example, decries "the light fog of fascism which seems to be descending on the universities" and which poses a tremendous danger for the future of Western values. "In universities there is almost a kind of an intellectual masochism, the sense that we should not be proud of the values that we stand for, that we even need to engage in a kind of a ritual self-flagellation," says Kenneth L. Marcus from the Louis D. Brandeis Center. "There is too little in our universities being taught about what the admirable aspects of the Western tradition are," declares Jeffrey Herf of the University of Maryland. The influence of multiculturalism, as historian Victor Davis Hanson and The Lawfare Project's Brooke Goldstein point out, has resulted in a moral relativism and a chilling effect on free speech, as any criticism of non-Western cultures is now deemed to be hate speech. Shurat HaDin (SHD), the Israeli lawfare group founded and funded initially by the Mossad to target Palestinian militant groups resisting Israeli Occupation, suffered a major defeat in a U.S. Supreme Court decision. The Court threw out a claim advanced by the group's attorney on behalf of 6,000 family members of Palestinian terror victims, against the Arab Bank of Jordan. The NGO claimed that the Bank had held accounts used by militants to organize and fund terror attacks against Israelis. "...Relatively minor connection between the terrorist attacks at issue in this case and the alleged conduct in the United States." It's general strategy, much like that of Kenneth Marcus' Brandeis Center, is based on a flimsy legal premise which many courts, when they hear the merits of the argument, reject. Similarly, it has launched a campaign suing social media platforms like Facebook and Twitter, blaming content posted by Palestinian and other Arab users for inciting terrorism. Jordan's largest lender, the Arab Bank, announced this week that a New York federal court dismissed more than 90 percent of the claims in a long-running lawsuit accusing it of providing banking services to charities and individuals allegedly affiliated with Palestinian militants. The ruling is the most significant victory yet for the Arab Bank yet in its nine-year legal battle with 6,596 relatives of victims killed or injured in two dozen Palestinian attacks in Israel during the Second Intifada. Most of the plaintiffs who are not U.S. citizens were seeking hundreds of millions of dollars in damages from one of the Levant's largest financial institutions under an obscure anti-piracy law passed in 1798, the "Alien Tort Statute," which allows foreigners to file civil claims against international companies who violate U.S. law in the nation's federal courts. More than 500 plaintiffs who are U.S. citizens are suing the Arab Bank under a rarely cited provision of the U.S. Anti-Terrorism Act that allows victims of international terror attacks to seek compensation in federal courts. A statement posted on the Arab Bank's website Sunday said that on Aug. 23, Judge Brian Cogan of the Court of the Eastern District of New York ordered the dismissal of the claims filed by over 6,000 of the plaintiffs under the Alien Tort Statute. When contacted by The Daily Star, an Arab Bank legal representative refused to comment on whether the decision would affect the remaining 503 cases filed against the bank under the Anti-Terrorism Act. A trial is scheduled to take place in January 2014, marking the first time a bank has been tried in the U.S. for terrorism financing under the act. 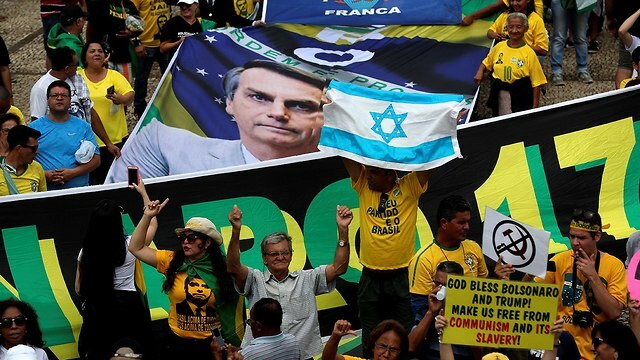 The Israeli and Hungarian prime ministers, Benjamin Netanyahu and Viktor Orbán, joined the US secretary of state, Mike Pompeo, and the Bolivian president, Evo Morales, at yesterday's inauguration of Brazil's new far-right president, Jair Bolsonaro. Secretary Pompeo will lead the Presidential Delegation to Brasilia to attend the inauguration of Jair Bolsonaro, President-elect of Brazil. In addition to joining inauguration-related events, he will participate in a bilateral meeting with incoming President Bolsonaro and Foreign Minister Araujo to reaffirm the strong U.S.-Brazil partnership in promoting prosperity, security, education, and democracy. While in Brasilia, Secretary Pompeo will also participate in bilateral meetings with Peruvian President Martin Vizcarra and Israeli Prime Minister Benjamin Netanyahu. In the aftermath of the London bombing!